Grass-fed, slow cooked, slow smoked, perfectly seasoned beef. For those who like their protein pure and simple, the original is perfectly seasoned with salt, pepper and other tasty little spices. Ingredients: Grass fed beef, sea salt, lactic acid, honey, celery juice powder, black pepper, red pepper, garlic, coriander, onion powder. I love these bars glad well.ca carries them! Would be nice to have fewer ingredients but they taste great and so much better than cereal or grain based energy bars that are not human food. I really enjoyed this bar. It is very meaty with a definite meat aftertaste which is uncommon but I liked it. It had a soft texture (not hard and chewy like jerky). 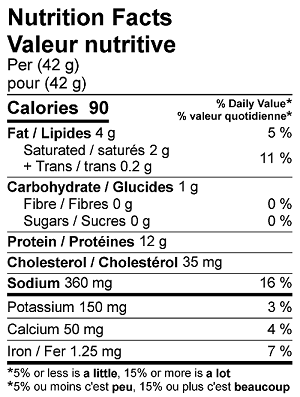 Simple ingredients, just gotta watch out for the sodium intake for the day if you consume one of these. 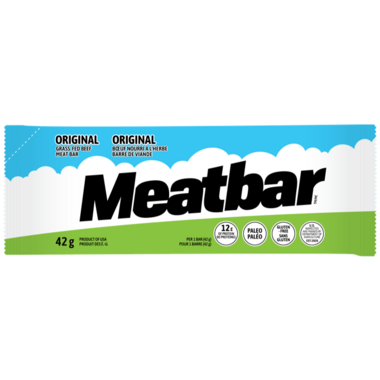 I don't care for the flavour, but it's a meat bar and tastes like meat so it's not really the bar's fault! It seems sorta sweet. This is a very high quality product that tastes good and has a firm, chewy texture. And there's no nasty hard bits from bone fragments or cartilage. Just pure meat! I really liked this "jerky" bar. I've been trying to eat keto and it only has 1 gram of carbs in the whole bar and tastes great! I DO NOT LIKE THE TASTE OF THIS PRODUCT, WHICH IS OTHERWISE FINE. I FIND IT TOO EXPENSIVE FOR ME AS I EAT A LOT OF SUCH ENERGY BARS.